This Tsujiri 辻利 is not the same Tsujiri in Singapore. A long established teahouse in Uji, it has opened a take-away outlet at the newest chi-chi mall in Tokyo — Ginza Six. An exclusive to said mall, the “extra rich” matcha soft serve is expectedly good but I’m one of those annoying customers who want a stronger dose of matcha ha. I plan all my meals. Like seriously, ALL. Impromptu is not in my vocabulary because life is too short for mediocre food. So I took a big risk (yes I exaggerate ha) when I stepped into Patisserie Cacahouete Paris パティスリー カカオエット・パリ as this was not on my to-go list. But I couldn’t resist when I saw so many locals queuing! Walked out with a crunchy chocolate cake with mango, a lovely pairing which I really like. Anyway, this place is apparently famous for their cubed cream puffs (there’s pistachio! ), should I try that next hmm. I find it interesting that some brands dare to claim that they are the world’s best. Gomaya Kuki has “the world’s richest sesame ice cream”; bubó Barcelona has “the world’s best chocolate cake”; I asked K whether we should state Matchaya has “the world’s best matcha soft serve” and he rejected me hahaha. bubó Barcelona ブボ バルセロナ is by famous chef Carles Mampel and it’s coincidentally (?) right across Dominque Ansel Bakery in Omotesando. Xabina (シャビーナ) was voted best chocolate cake in Lyon in 2005 and that’s what I came for. Pricey at 1,000円 for a small cake but the quality of chocolate is undeniable. Dark, rich and very smooth. Not convinced it’s the best in the world though. 1. Gorgeously plated food prepared with finesse and techniques as if from a fine dining kitchen… Espuma, emulsion, sous vide, confit, coulis, anyone? 2. Affordable price tags with the most expensive item on the menu being $20++ for a torched ribeye steak! Believe me. 3. Fabulous playlist (remember Joey McIntyre’s Stay the Same?? ), though I’ve been fairly warned that the songs they play depend on the mood of the staff haha. By default, salted egg softshell crab fettuccini is one of the mains on the menu but when Chef Nixon knew that I’m not a fan of pastas, he threw in a pasta-less version as an appetiser. I’m already biased towards anything softshell crab, but when paired with a buttery and aromatic salted egg sauce? Pure unadulterated bliss. I had to forcibly stop myself from drinking the sinful sauce even after the softshell crab was long gone. Yes, it was that good a winning dish! There was a lot going on in this soup. On its own, the wakame salad was too salty, the pumpkin soup too flowery sweet. Together, the taste was interesting, for want of a better word. I can’t say I’ll order it again, but you may? Two more words: must eat. There’s plenty of duck confit around but a chicken version? 12 hour brined chicken leg slow-cooked in its own fat and shallow-fried, I’ve got feedback that this was tender and juicy. Stunning presentation right? It’s a shame that this is the only fish dish on the menu; hopefully Chef Nixon will introduce more main courses for pescetarians soon! I’ll be the first in line. This is actually on the all-day breakfast menu but Chef Nixon cleverly served it as a lovely pre-dessert. I’m a yogurt fanatic (I make my own yogurt at home cuz with the amount I’m consuming, the grocery bill was getting more and more expensive) and I approve this! No doubt, the piece de resistance of Petite Menu. I don’t even like blackforest to begin with but this deconstructed version was so sooooo good! Everything just clicks. And $8++ for such a fancy dessert?! Sold. Ok, this was a tad too deconstructed and confusing for my palate. Definitely go for the blackforest! Special thanks to Li-lin and Chef Nixon for the kind hospitality! DeSté is the brainchild of (and named after) pastry chef Stefano Deiuri and it’s a pastry laboratory and retail store specializing in chocolates and cakes under the Garibaldi Group. Chef Stefano is well known for combining traditional pastry making with new molecular techniques to create unconventional desserts. Now, there’s even a line of sugar free chocolate pralines for those who want to indulge without guilt! As I’ve tried almost all of Ricciotti’s desserts, I’m no stranger to his creations since he’s also the man behind Ricciotti’s pastries and gelato. Potato ($7.90+) has such an irresistible name! A giant puff filled with dark chocolate custard, this was our favourite for the night. The puff was very soft and the custard creamy enough without being cloyingly rich. Simple yet satisfying. Usually Profiteroles ($9+) come in either chocolate or vanilla filling but DeSté goes one step further with a pistachio filling so you get 3-in-1. Nothing special about this, not even the light-as-styrofoam chocolate cube. Honestly, we were far more interested in the base of chocolate sponge cake which was moist and soft. The Tiramisu ($9+) was not shortlisted at first as I wasn’t impressed with the version at Riccioti before. But sadly, the lady in front of me had the last slice of Piedmont Pave which I was eyeing! Oh well. This was just average to me since I prefer my tiramisu to contain both caffeine and alcohol but the ladyfingers are merely soaked in coffee at DeSté. I had one bite of the Champagne & Raspberry Delight ($8.80+) and forced the cousin to finish the rest of it! We totally didn’t like this at all. It’s supposed to be Champagne Bavarian cream with two textures of raspberry jellies but there’s no hint of champagne and I couldn’t detect the different texture of the jellies because my tastebuds are not discerning enough, hah. This reminds me of the creamy concoctions at Schokolart! Decent but not outstanding. I think next time I’ll just stick to the chocolate creations to be on the safe side since Chef Stefano’s strength lies in working with chocolate. Definitely no more Champagne & Raspberry Delight! The boutique outlet in chi-chi Mandarin Gallery is only for takeaways and there’s 40% off all individual and whole cakes after 8.30pm. If you want to dine in and enjoy Chef Stefano’s cakes, look no further than the new Chocolate DeSténation at 313@Somerset! Earlier this month, a bunch of food bloggers and I were invited to Blic for an ice cream tasting session. 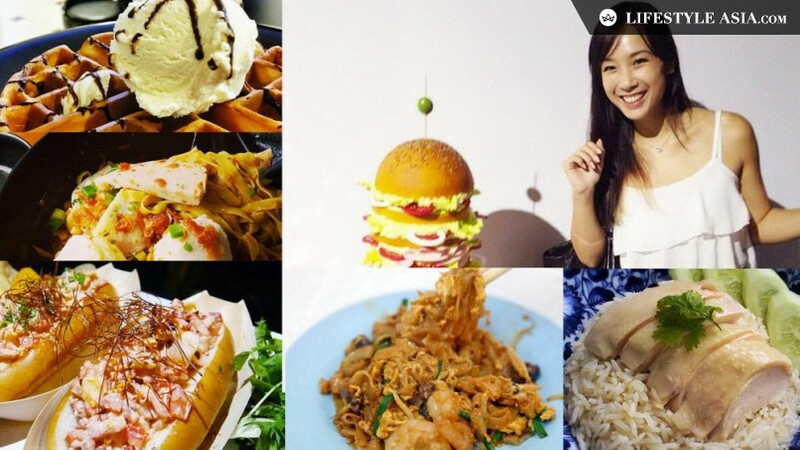 It’s a new ice cream parlour located in the heartland of Tampines and offers more than 20 flavours to choose from. Of course, being the foodies that we are, we sampled all of them! Rum N Raisin: The plump rum-soaked raisins topping the scoop are amazing. More than make up for the lighter liquor flavour in the ice cream itself. Passion Yogurt: This is really more like sour plum than passionfruit. Love the tanginess! Baileys: My favourite out of the favourites! Very smooth and with a strong dose of liqueur for that extra kick. Blic’s Tiramisu is uniquely served in a glass with layers of soaked savoiardi and ice cream (instead of mascarpone cheese). Go ahead, be greedy and take a really big and deep scoop so that you don’t miss out any components. Banana Peanut Crunch: Surprisingly light and not too sweet. Seasalt Malt: Get this if you love Horlicks! Black Sesame, Green Tea: You know I’m always on the lookout for good BS & GT ice cream! Sadly, these aren’t making their way onto my list. Double Choc, Ferrero, Vanilla Bean: the classic flavours that’s always a hit. Dino Milo: Can you believe I’ve never tried the real dino milo drink before? This tastes like… Milo (duh! ), hah. Lychee Mint: I can’t decide whether it’s a good or bad thing that this is more fruity than minty. Mao Shan Wang Durian, Cempedek: Whoa, these are really strong. You either love it or hate it. FYI, durian is the only fruit I don’t eat so you know which camp I belong to, hah. Sigh, how I wish there’s an ice cream parlour in my neighbourhood too!